Today’s complaint is about newsletter management, specifically the sign-up and unsubscribe processes. I’ve noticed that I’ve been signed up for newsletters on the basis of a single contact with the company, perhaps a service enquiry, or a downloading a white paper. I’ve also seen email suppliers making it hard to unsubscribe from unwanted newsletters. These two annoyances combine into one big annoyance with a company that really should know better. Please stop signing me up for newsletters without a specific opt in. Just because I visited your site, or emailed you once does not mean I want to hear from you again. Let me opt-in. Do not make it a condition of using your services (looking at you, Microsoft). I have an email account that I use only for sites I think might spam me. 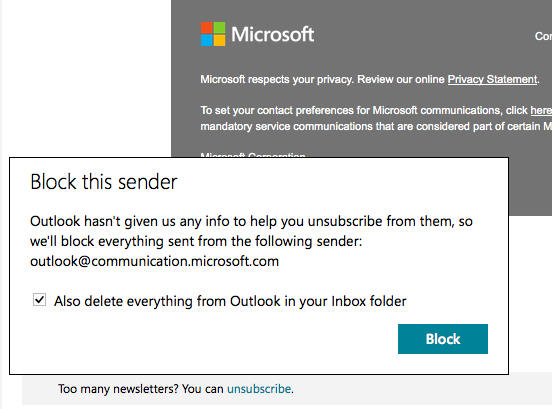 I use a junk filter est to “exclusive” in Hotmail so I never see them. At some point Microsoft started sending me emails relating to their products and services to my Hotmail account. Pretty sure I didn’t sign up for it, but Hotmail belongs to Microsoft so I get it. I clicked on the handy “unsubscribe” button at the bottom of one of these emails, and got this. Outlook has not given Outlook any info to help me unsubscribe from them. Translation; Microsoft does not let you unsubscribe from their emails in their own email service. That’s a design choice, they make it difficult for you to unsubscribe so that won’t do it. The result is that they are now blocked. I’ve used Microsoft as the example here, but they’re not the only ones guilty of random spamming. In the last month I have been signed up for newsletters from conference organisers, potential suppliers, and random companies who guessed my work email. I’ve unsubscribed from them all. Where that hasn’t been possible I’ve flagged them as “junk”. If that happens often enough at work their email domain could be blocked.